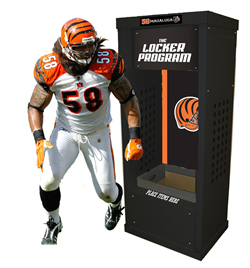 The Locker Program is a "giving initiative" that pairs athletes with community-minded schools and students to collect and distribute household items for the benefit of children-in-need. This service-learning program not only helps combat poverty, but also teaches children the valuable lesson of helping others. This program received the highly distinguished Live, Learn and Thrive grant from P&G and was recognized for its creativity, branding, domestic and global impact. During the months of October, November, February and March elementary and middle school students are encouraged to donate items based on the predetermined monthly theme, including school supplies, food and personal hygiene. The celebrity locker serves as a collection bin for the goods where the students can drop off their items. The donated items are then collected and distributed to agencies that the schools have selected to help children.